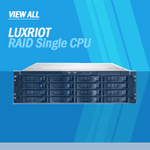 Luxriot Raid Servers (Single CPU) Raid6 servers. These NVR Servers are designed and configured with high performance hardware to accommodate large security and surveillance deployment that require exceptional redundancy and performance. 3 On-site hardware support included.